A funeral program is a document that outlines key points of a funeral or memorial service. New funeral software offers funeral professionals the ability to personalize the funeral program as well as other personalized stationery to meet client families needs and desires for a complete life celebration. The family of the deceased usually provides the information for the memorial program to their death care professional. Often families wish the memorial program to be highly personalized and those that attend a memorial will hold on to the funeral stationery as a keepsake. Included in a order of service program are usually items such as: the entrance song or hymn, an opening prayer, some readings, additional funeral music and more prayers. Additionally each customized memorial program can provide other personal details such as poetry or verses of significance, a biography of the deceased, names of surviving family members, and an obituary of the deceased. Some families even include a thank you to their guests for having attended the service. Funeral programs can be further customized with a professionally designed theme and printed using the latest funeral software. Stationery for a memorial has been changed forever with this robust funeral technology. 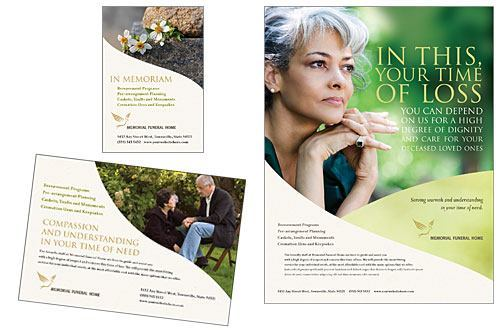 Now death professionals can add personal photos and theme the memorial programs to be coordinated with other funeral stationery to best represent the deceased’s life. 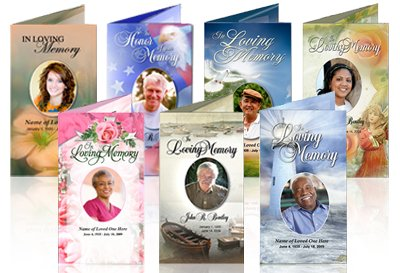 A vast amount of theme options make creating a unique and personal memorial program easy. Using this new funeral software, funeral professionals have the ability to offer a client family over 450 different backgrounds for their memorial program and personalized stationery. These themes represent almost every interest, hobby, occupation, and religious background. The full-color, professional quality of these funeral programs are a far cry from the pre-printed funeral stationery of yesteryear. A memorial program should be detailed and share the unique personality traits of a families loved one. Having generic stationery and funeral programs in this day and age is unacceptable. Pre-printed funeral stationery definitely cannot offer the options and reflect the individuals unique qualities. Thankfully funeral software and stationery is progressing along with client families needs and wishes.